Director Jonathan Jakubowicz (right) at the New York Premiere of HANDS OF STONE. ©WEINSTEIN CO. Growing up in Caracas, Venezuela, Jonathan Jakubowicz admired boxing legend Roberto Duran, who hails from Panama. Never in his wildest dreams did he imagine that one day he would make a biographical film about the famed pugilist, nicknamed Manos de Piedra (or Hands of Stone), for his incredible punching power. Destiny has a funny way of making the unexpected happen, though. With “Hands of Stone,” Jakubowicz has not only made a film about his childhood hero, he also got to work closely with the now 65-year-old Duran and his family in making the film. Duran, whose career in the ring spanned five decades, and his son trained Venezuelan actor Edgar Ramirez to box. Additionally, Jakubowicz enlisted Duran’s main rival, American boxing legend Ray Charles “Sugar Ray” Leonard, to serve as a consultant on the based-on-true-events drama as well. Leonard trained Usher Raymond IV, better known simply as Usher, to box like he did. If that wasn’t enough star power for one film, Jakubowicz also cast two-time Oscar winner Robert De Niro (who played boxing legend, Jake LaMotta in the Oscar winner “Raging Bull”) to portray Duran’s crusty American trainer Ray Arcel. Ruben Blades, John Turturro, Ellen Barkin, Ana De Armas and Jurnee Smollett-Bell round out the cast. At a press day, the enthusiastic and genial Jakubowicz spoke about bringing the story of one of boxing’s greatest matchups to the big screen. 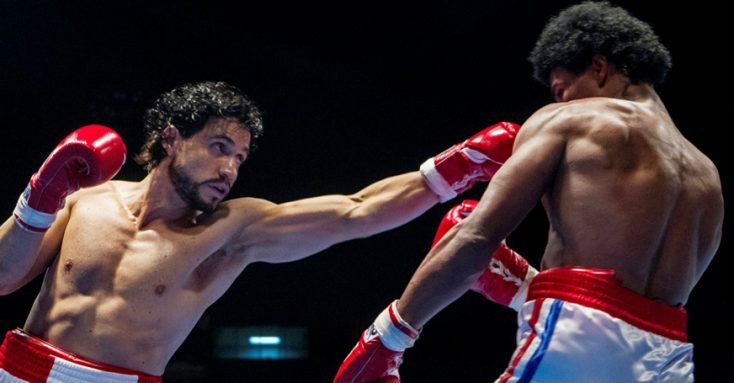 Q: Both Sugar Ray Leonard and Roberto Duran helped train Usher and Edgar Ramirez, respectively, to box for this film. What was it like getting their cooperation to make this film? Jakubowicz: It’s as good as it gets because at the end of the day, these fights are legendary. They’re on YouTube. Everybody can compare your movie to the (actual) fights. So you want them to be as accurate as possible. It just doesn’t get better than the actual source. There’s a clip of Usher training with Leonard, and we have (video) of Edgar training with Duran and also with Duran’s kids. They got together with him when he knew nothing about boxing. A big part of it is how we shot it but the most important part is how Edgar and Usher replicated their style. Q: Usher is best known for his music. Why did you choose him? Jakubowicz: It all started when I was looking for an actor to play Sugar Ray and couldn’t find anybody who was really nailing it. So I went to Freddie Roach, Manny Pacquiao’s trainer, and I asked him if he knew if there was a fighter who could portray Sugar Ray, and he said, “For Sugar Ray, you should get a dancer.” It’s very hard to find a fighter who can box Leonard’s style. That’s why Leonard is Leonard. He’s so unique and slick and his (style) is so choreographed that it’s easier for you to find a dancer and teach him to box than to find a fighter and teach him to box the way (Leonard) did. So I went home and thought about who’s the best dancer in the world and I thought of Usher. Everybody around me said, “You’re nuts.” It’s going to be distracting. Usher’s not known as a tough guy.” I reached out to him and sent him the script. Then we met and he was really in love with the idea. He did the Ali Shuffle the first time we met. He prepared for about a year. He fought really hard to become Sugar Ray. He knew he had more to prove than usual. Everybody expects him to fail. He also isn’t known as an actor. But he’s an overachiever and he’s mind-blowing in the movie. Now, everybody’s celebrating how great he is in the movie. Not only in the fight scenes but also in the dramatic scenes. We worked really hard on those scenes and rehearsed a lot, and he kind of steals all those scenes he has in the movie. I think audiences are going to appreciate that he’s a very talented man. Whenever he sets a goal for himself, he gets there. Q: What did Usher have to bring to the role of Sugar Ray Leonard? Jakubowicz: Leonard is a showman. When I first told him I was thinking of casting Usher to play him, he started trying to convince me that Usher was the right person. He said, “It’s all about the smile.” He said, “Make sure he has the right smile. I’ll take care of the rest.” And he did. He trained him and took care of everything. Q: There are so many different larger-than-life figures depicted in this. How did you keep the film focused on Duran? Jakubowicz: You could make a movie about each of those characters and it would be a good movie. That’s what was so fascinating. To me, the key was the hardest of all was to make a movie about Roberto Duran because he is the classic Hollywood villain. The typical Hollywood movie would have been about Leonard’s comeback and Duran would be the villain. It was a challenge and a brave decision to tell a story with Duran as the centerpiece because we’re so used to seeing Latinos portrayed as drug dealers and criminals and darker elements so we see him as a hero, but he’s a cool hero. He’s not a saint and he’s not trying to be a saint. To me, all the things that were told about Leonard and Ray Arcel and Don King had to service the background of what was going on in Duran’s story. Yes, we go into Ray Arcel’s personal life but it’s in order to show what vacuum existed in Ray Arcel’s soul was filled by Roberto Duran. We do the same with Leonard. It’s a big part of his relationship with his wife but if we so how his personal frustrations are solved by this woman as well. I saw this movie as the women being stronger than the men. Q: Isn’t that usually the case? Jakubowicz: It is, except in boxing movies. That’s why I made an effort to show that each of these men have a rock next to them that helped them get to where they got. You know how they say, “Behind every great man is a great woman?” Sometimes the man isn’t even great but the woman next to him is so great that she makes him achieve greatness. It’s certainly that in my case. My wife is the producer of this movie and there is no achieving any of this without her help. It’s an important part of the movie and I think it should be noted that in this time when female Olympic athletes are winning and nobody celebrates that. Every time they’ve tested this movie with audiences, it always tests better with women. Q: And you’re working with Robert De Niro. What was that like for you as a director? You worked closely with him on his character, Ray Arcel. Jakubowicz: The first time we met, he told me, “Listen, if you’re making a serious boxing movie with me in it, you’re going to be compared to ‘Raging Bull.’ It’s harder than you think. Are you sure you want that?” It was a process to get him to commit to the project. It was interesting because he liked my first movie and he liked this script, but he told me he couldn’t hear Ray Arcel’s voice. So then I developed the script with him for six months. We meet with Ray Arcel’s widow in New York City. She had a notebook in which she had written “Ray-isms,” which are things that only Ray used to say. In other words, it was his voice. So she was extremely helpful to me and became close to me and De Niro, but unfortunately she passed away last year so she never saw the completed film. But the movie is dedicated to her. By the time De Niro got to set, we were very close already so he wasn’t as intimidating as he might have been. Still there were moments where I thought, “Wait! I’m directing Robert De Niro.” And for the crew, which was mostly a Latin American crew, they were not used to working with Hollywood stars, let alone a Hollywood legend. The crew is usually very loud in Latin America but when De Niro walked onto set, everybody was silent. Even (De Niro) was looking around like, “What’s going on?” And then I’d introduce him, and everyone cheered. It was a fun shoot for him too because we shot with a lot of extras. Sometimes we were shooting with 300 extras. They were silent during the take, but then when we cut, it was like a Broadway play. Everyone cheered. So for Bob, it was very exciting. It was a fantastic experience. They were always very close to his heart. And he was very happy working with Edgar. We may be doing another movie together so… It couldn’t have gone better. Q: Shooting this in on location in Panama was a big deal for that country. Was there a lot of pressure to depict the country and did you have a lot of people wanting to hang around the set to watch you make this? Jakubowicz: There are 3.5 million people in Panama so that means there are three-and-a-half-million experts on Roberto Duran. That was a good thing because everybody remembers stories about him and it paid off in the research and getting (the story) right. I spent a long time there before we shot the film. Everybody just trusted us because of the cast we brought. They felt we must be serious. It was actually a constant energy towards helping the movie from the entire country—from the government to the financiers and everybody in the locations. They all wanted to see this movie get made, and this story to be told. They all have been living with this story of Roberto Duran and I’m happy that now the whole world is going to be able to see it. So it’s a big accomplishment for everybody. They are so excited in Panama. I think they are interviewing the entire crew. I’m talking assistants are being interviewed on TV. I’m really proud of them and it’s very exciting for everybody. Jakubowicz: I’m working on something with Bob (De Niro), and we’ll announce it when we’re ready.